Synthetic peptide corresponding to Human alpha smooth muscle Actin (N terminal). WB: Jurkat whole cell lysate (ab7899), HeLa whole cell lysate (ab150035) and nuclear lysate, HEK-293 whole cell lysate. FC: SV40LT-SMC. IHC-P: Human breast ductal carcinoma tissue. ICC-IF: SV40LT-SMC cells. This antibody reacts with smooth muscle cells of blood vessels and parenchymal tissue of intestine, testis and ovary. 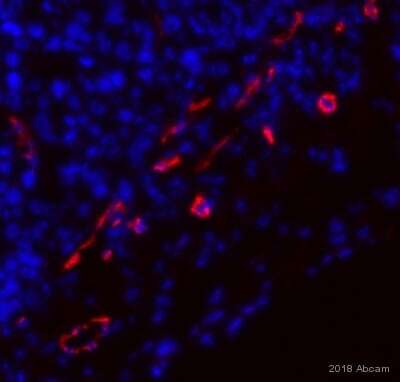 This antibody clone [1A4] is manufactured by Abcam. Our Abpromise guarantee covers the use of ab7817 in the following tested applications. Flow Cyt Use 0.1µg for 106 cells. Defects in ACTA2 are the cause of aortic aneurysm familial thoracic type 6 (AAT6) [MIM:611788]. AATs are characterized by permanent dilation of the thoracic aorta usually due to degenerative changes in the aortic wall. They are primarily associated with a characteristic histologic appearance known as 'medial necrosis' or 'Erdheim cystic medial necrosis' in which there is degeneration and fragmentation of elastic fibers, loss of smooth muscle cells, and an accumulation of basophilic ground substance. 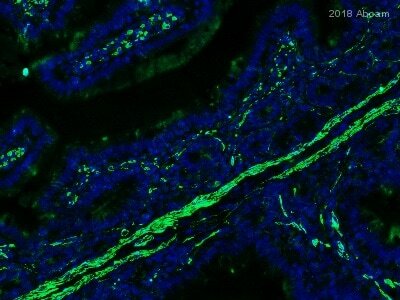 Ab7817 staining alpha smooth muscle actin in Mouse intestine tissue by Immunohistochemistry-Immunofluorescence. Tissue was fixed with formaldehyde and blocked with 100% Cas-block for 30 minutes at room temperature; antigen retrieval was performed by heat mediated citrate buffer, pH6. The sample was incubated with primary antibody at 1/200 dilution for 16 hours at 4°C. 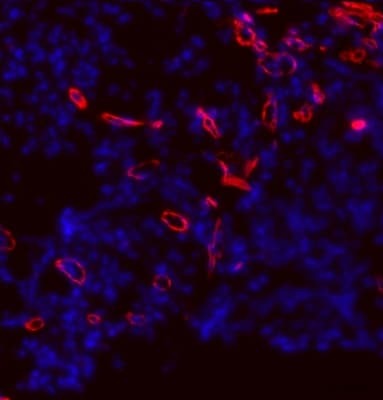 An Alexa Fluor® 488 Goat anti-mouse IgG was used as the secondary antibody at 1/400 dilution. 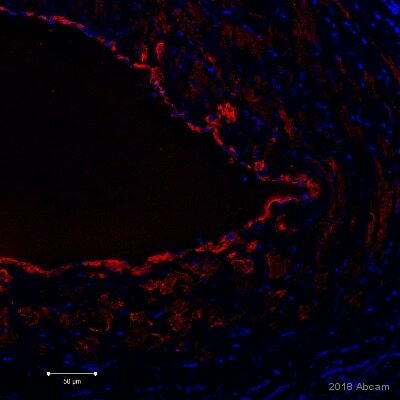 Autofluorescence was blocked with 0.1% Sudan Black in 70% ethanol for 10 minutes at room temperature after antigen retrieval, and followed with 3X wash with PBS-T after antigen retrieval. 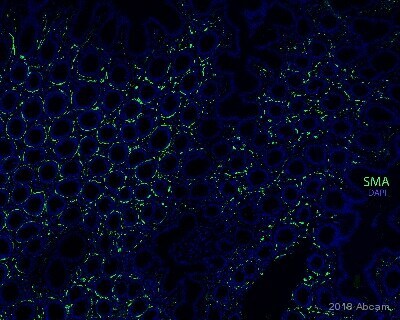 Image was taken with confocal microscope. ab7817 staining alpha smooth muscle Actin (green) in Mouse primary colon myofibroblasts by ICC/IF (Immunocytochemistry/immunofluorescence). Cells were fixed with acetone and blocked with 5% BSA for 30 hours at 25°C. Samples were incubated with primary antibody (1/100 in PBS + 5% BSA) for 2 hours at 25°C. Donkey Anti-Mouse IgG H&L (DyLight® 488) (ab96875) (1/1000) was used as the secondary antibody. 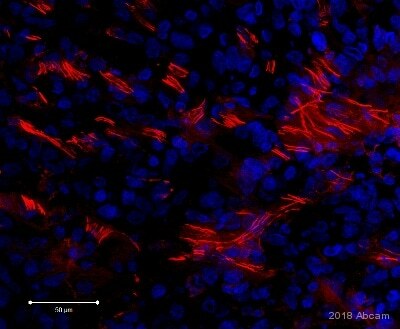 Costained with ab92547, Rabbit anti-Vimentin (red). IHC image of alpha smooth muscle actin staining in a human breast ductal carcinoma formalin fixed paraffin embedded tissue section*, performed on a Leica Bond™ system using the standard protocol F. The section was pre-treated using heat mediated antigen retrieval with sodium citrate buffer (pH6, epitope retrieval solution 1) for 20 mins. The section was then incubated with ab7817, 0.1µg/ml, for 15 mins at room temperature and detected using an HRP conjugated compact polymer system. DAB was used as the chromogen. The section was then counterstained with haematoxylin and mounted with DPX. ab7817 stained in SV40LT-SMC cells. The cells were fixed with 4% paraformaldehyde (10min) at room temperature and incubated with PBS containing 10% goat serum, 0.3 M glycine, 1% BSA and 0.1% triton for 1h at room temperature to permeabilise the cells and block non-specific protein-protein interactions. The cells were then incubated with the antibody ab7817 at 5µg/ml overnight at +4°C. The secondary antibody was Goat Anti-Mouse IgG H&L (Alexa Fluor® 488) preadsorbed (ab150117) (colored green) used at 1 ug/ml for 1hour at room temperature. DAPI was used to stain the cell nuclei (colored blue) at a concentration of 1.43µM for 1hour at room temperature. Western blot - Anti-alpha smooth muscle Actin antibody [1A4] (ab7817)This image is courtesy of an Abreview submitted by Julien Chevalier. 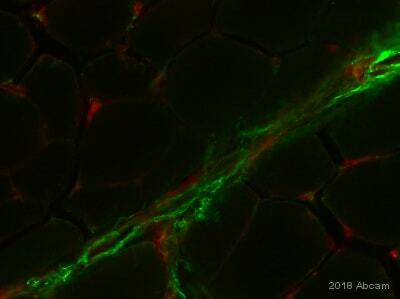 Anti-alpha smooth muscle Actin antibody [1A4] (ab7817) at 1/200 dilution (Samples were incubated with primary antibody for 16 hours at 4ºC with TBS Tween 0,5% Lait 5% NaN3.) + Mouse intestinal tissue at 14 µg with 5% milk for 1 hour at 25ºC. Immunocytochemistry/ Immunofluorescence - Anti-alpha smooth muscle Actin antibody [1A4] (ab7817)Image from Davis FM et al., Nat Commun 25(7). Doi: 10.1038/ncomms13053. Davis FM et al investigates the differentiation potential of mammary stem cells in adults. Ab7817 staining smooth muscle actin in EYFP+ cells from R26[CA]30EYFP mouse at 1:200 dilution. Immunocytochemistry/ Immunofluorescence - Anti-alpha smooth muscle Actin antibody [1A4] (ab7817)This image is courtesy of an anonymous abreview. ab7817 staining alpha smooth muscle Actin in human IMR-90 (Human Lung Fibroblast Cell Line) cells by ICC/IF (Immunocytochemistry/immunofluorescence). Cells were fixed with paraformaldehyde, permeabilized with 0.1% TritonX-100 and blocked with 100% Cad-Block for 30 minutes at room temperature. Samples were incubated with primary antibody 1/200 in antibody diluent buffer for 16 hours at 4°C. An Alexa Fluor® 488-conjugated polyclonal Goat anti-mouse IgG, dilution 1/400, was used as secondary antibody. 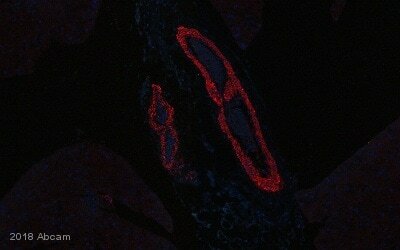 ab7817 staining alpha smooth muscle Actin in mouse heart cells by ICC/IF (Immunocytochemistry/immunofluorescence). Cells were fixed with paraformaldehyde, permeabilized with TritonX-100 and blocked with 5% BSA for 30 minutes at room temperature. Samples were incubated with primary antibody 1/100 in blocking buffer for 2 hours. An Alexa Fluor® 488-conjugated Donkey monoclonal to mouse IgG, dilution 1/200, was used as secondary antibody. ab7817 staining alpha smooth muscle actin in Human liver tissue sections by Immunohistochemistry (IHC-P - paraformaldehyde-fixed, paraffin-embedded sections). Tissue was fixed with paraformaldehyde and permeabilized with wash buffer with tween; antigen retrieval was by heat mediation in Tris-EDTA buffer, pH 9.0. Samples were incubated with primary antibody (1/100 in blocking buffer) for 30 minutes at 20°C. A HRP-conjugated Goat anti-mouse IgG polyclonal (undiluted) was used as the secondary antibody. Immunohistochemistry (Frozen sections) - Anti-alpha smooth muscle Actin antibody [1A4] (ab7817)This image is courtesy of an abreview submitted by Ruma Raha-Chowdhury. ab7817 staining alpha smooth muscle Actin in human brain tissue sections by Immunohistochemistry (PFA perfusion fixed frozen sections). Tissue samples were fixed by perfusion with paraformaldehyde, cut into 20 micron slices, permeablized with 0.1 M PBS with 1% Triton X and blocked with 10% serum for 60 minutes at 24°C. The sample was incubated with primary antibody (1/200 in 0.1M PBST with 10% donkey serum) at 4°C for 24 hours. An Alexa Fluor® 568-conjugated donkey monoclonal (1/1000) was used as the secondary antibody. Isotype control antibody (black line) was mouse IgG2a [18C8BC7AD10] (ab170191) used at the same concentration and conditions as the primary antibody. Unlabelled sample (blue line) was also used as a control. This antibody gave a positive signal in HeLa cells fixed with 80% methanol (5 min)/permeabilized with 0.1% PBS-Triton X-100 for 15 min used under the same conditions. Immunohistochemical analysis of mouse aorta (A) or skin (B) tissue, staining alpha smooth muscle Actin with ab7817. Tissue was fixed with 10% Neutral Buffered Formalin and blocked with 1% serum for 45 minutes 21°C; antigen retrieval was by enzymatic method in 0.0001% Trypsin-CaCl. Samples were incubated with primary antibody (4 µg/ml in 0.3% Triton X-100 in PBS) for 1 hour at 21°C. A biotin-conjugated horse anti-mouse polyclonal IgG (1/50) was used as the secondary antibody.